DJI’s new Spark drone is friendly to your pockets (even fits in a coat pocket) — and it can be controlled completely with hand motions. Finally a droid that falls for the Jedi mind trick. You read that right. All it takes is some hand waving and no silly incantations (voice commands, ehem, GoPro Hero 5 Black) and the DJI Spark will track you and take a picture of you or your group. Imagine that. Gone are the days we have to take turns to take family or group pictures during our gatherings or vacations. Neither would you have to pack a tripod to mount the camera to include everyone in the frame. DJI has been the leading manufacturer of drones. If you have seen aerial videos in movies, documentaries or music videos, chances are, they were filmed using one of DJI’s industrial grade drones like the DJI Inspire 2. They have also produced the top drones in the market now for enthusiasts. The most popular ones include the DJI Phantom 4 Pro and the DJI Mavic Pro, retailing at around $1499 and $999 respectively. Now that we know how much these drones usually cost, you can imagine why not everyone already owns a drone. That’s what makes the DJI Spark a great buy just in cost alone. You get all the DJI drone technology for only $499. That’s a $500 difference from the previous smallest model, the Mavic Pro. I almost bought a DJI Mavic Pro yesterday for some of the reasons DJI Spark is exciting me today. It’s the most portable among the drones I was considering. It folds in. The price is south of $1000. It is able to avoid obstacles. Thanks to the sensors that it has. It is able to track a target allowing you to just enjoy what you’re doing and the drone will take care of filming. Mavic Pro enables you to take a picture with just a hand gesture. Guess who the cool friend is. Spark’s boss. The Spark is designed with more functions that can be controlled with your hand, a remote control or your smart phone. It is roughly as small as an iPhone and almost lighter than FAA’s weight requirement for registering a drone. The Spark is available in different colors. With all these on tow, it looks like DJI may have figured out how to tap the average consumer market. 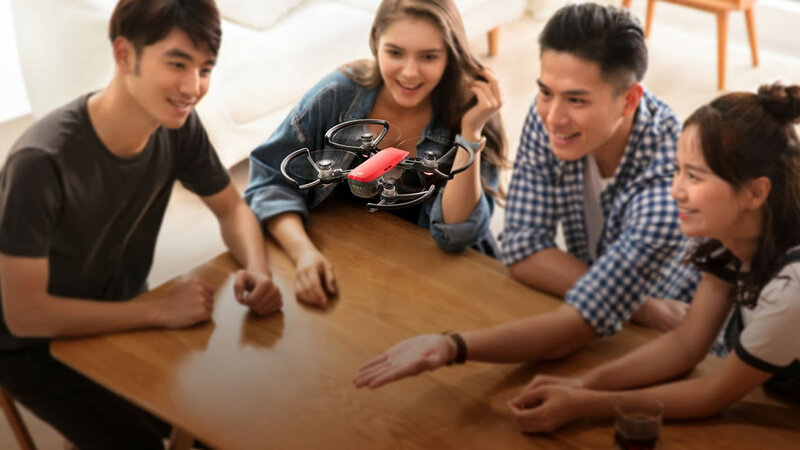 If you are looking into buying a drone for fun like documenting your family’s trip or life, this might just be the best beginner drone you can get. You can buy the DJI Spark for $499 from DJI’s online store.